To back its heavily favored Oscar “Best Picture” nomination, Netflix has spent an impressive $7.3 million on paid media advertising since early December, according to estimates released today by WPP’s Kantar Media. The vast majority -- 65% -- has gone into print, representing a $4.7 million windfall for just two newspapers in the ad schedule: The New York Times and the Los Angeles Times. 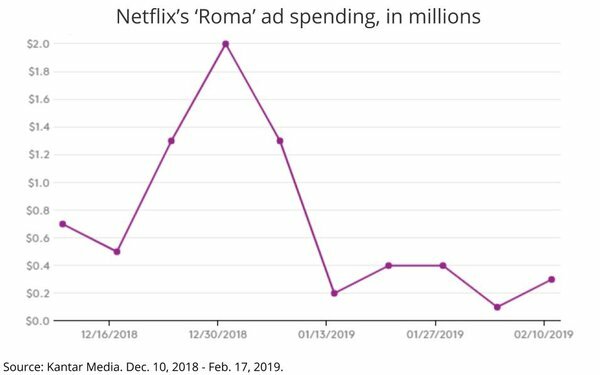 “The timing of Netflix’s investment was also quite shrewd, with $1.9 million spent during the week of December 31, while $1.3 million was spent on the weeks of December 24 and January 7,” the Kantar report notes. “Not coincidentally, Oscar nomination voting occurs from January 7-January 14.